This 2-in-1 ticket and tour experience combine one of our most popular Vatican tours with a skip-the-line Colosseum ticket. The ticket also grants access to the Roman Forum and Palatine Hill. Skip all Vatican lines with priority access and see all the major artistic and architectural highlights inside the Vatican City. Our entire Vatican tour covers the Vatican Museums, Sistine Chapel, Vatacombs where you'll see the underground tombs of former Popes, and St. Peter's Basilica in about 3 hours. You can read more about the tour itinerary for your Vatican tour here: Vatican Museums, Vatacombs and St. Peter's. After your tour of the Vatican, you'll get your timed skip the line ticket to Colosseum and directions about how to reach the Colosseum from the Vatican City. 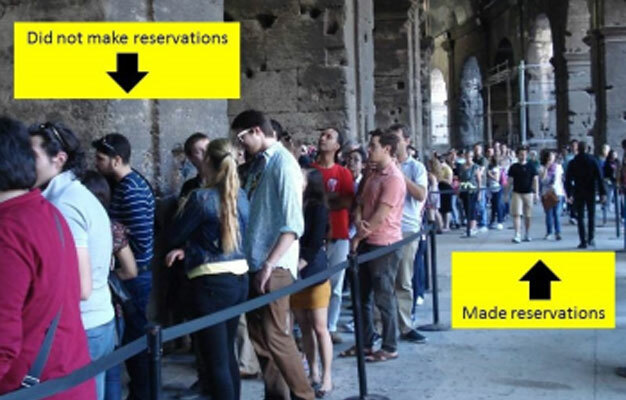 When you arrive at the Colosseum there will be two lines at the entrance, a very long line for people without tickets, and a short line or no line at all for you to walk straight into the Flavian Amphitheatre. We recommend that you spend between two and three hours in the Colosseum, Roman Forum, and Palatine Hill archaeological areas. You should keep in mind that each site operates a strict no re-entry policy. The tour starts at the When in Rome Tours office. The address will be on your e-ticket. Please be there 30 minutes before the tour starts. The guided tour ends at St. Peter's Basilica, where you'll be given directions to the Colosseum. The guided tour of the Vatican lasts approx. 3 hours. When can I visit the Colosseum? Your timed entrance ticket to the Colosseum is valid at 3:30 PM. La gira del Vaticano opera todos los días (excepto los miércoles y domingos) a las 8:45 AM. Su boleto de entrada programado al Coliseo es válido a las 3:30 PM.